Here's the latest poster illustration. It's part of an ongoing set of stand-alone drawings/paintings I've been working on recently. 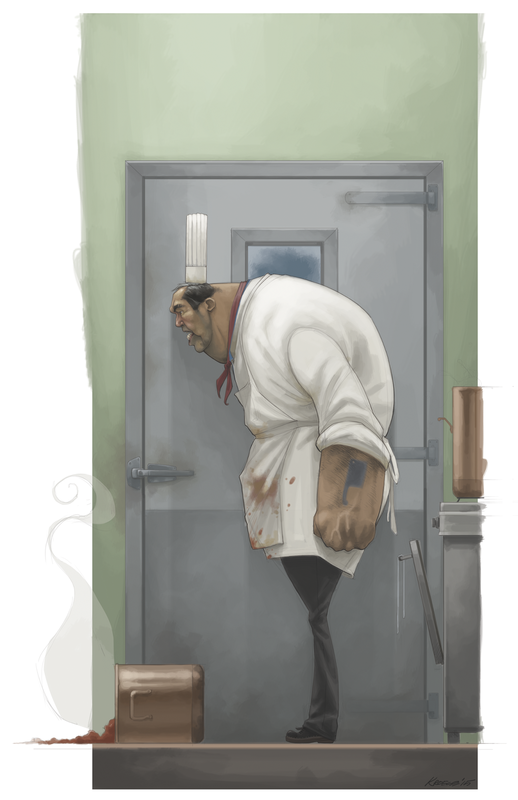 The genesis of this one came after I'd been watching a series on world-class chefs. The show intimated that many of them are intolerable humans. 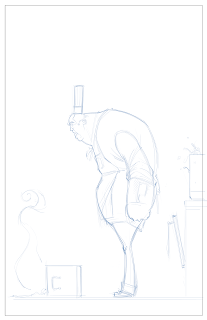 I thought it would be funny and interesting to draw a chef who was grotesquely proportioned and scary-looking at the moment just after a kitchen catastrophe and just before his apoplectic response. This one is for sale one tab over at the "Buy Stuff" page. Iff'n you're interested. 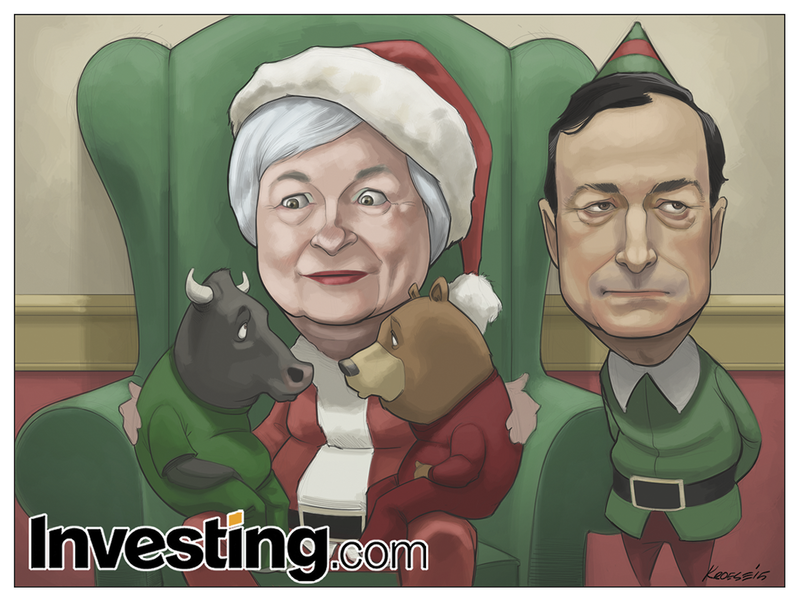 In celebration of said holidays, here's the holiday-themed comic for Investing.com. Here's the latest comic for Investing.com. It came a day early this week, which meant some last-minute schedule reshuffling and a little more of a mad-dash feel, but otherwise it was a fairly straightforward comic. The subject this week is the Federal Reserve meeting tomorrow (I'm writing this Tuesday but it won't post until Thursday) wherein Janet Yellen is finally expected to announce that the Fed intends to raise interest rates for the first time in six years or so. 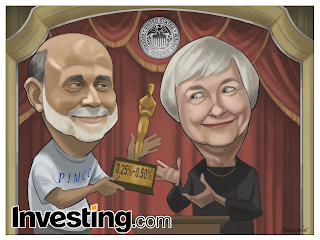 The crew at Investing.com asked me to draw a fancy, Oscar-like theater, in front of which Former Fed Chair Ben Bernanke hands current Chair Janet Yellen an Oscar-like award with the projected interest rate numbers on it. Post-Game Commentary: Because the comic was a day early and I felt even more rushed than usual, I can't say this is my best work. However, I think it's serviceable. And somehow, even after SO many financial comics and SO many times drawing both Bernanke and Yellen, it's still kinda fun. Shading their faces in particular is still interesting to me. Granted, I think it has something to do with my experiments with a more loose style, but still. That's something to be thankful for. Here's the latest comic for Investing.com. 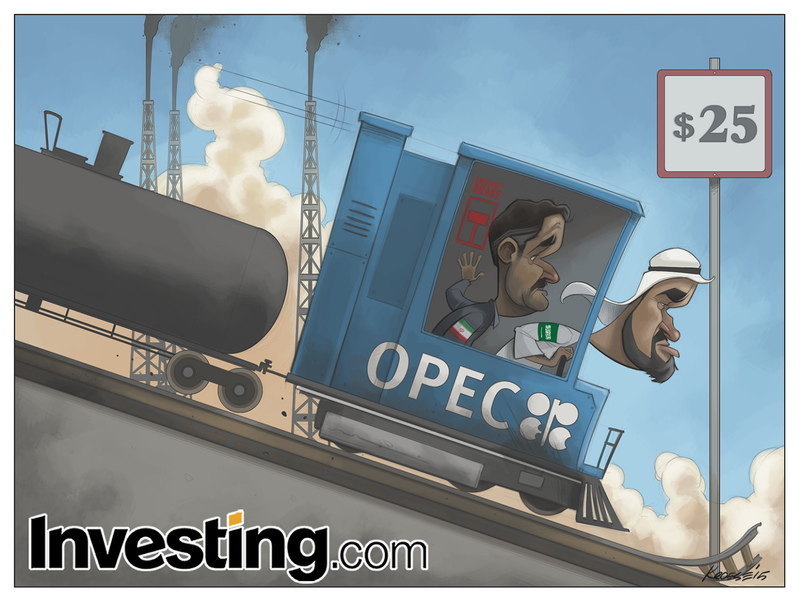 This time around, the subject is the continuing slide in oil prices and the subsequent geopolitical consequences thereof. 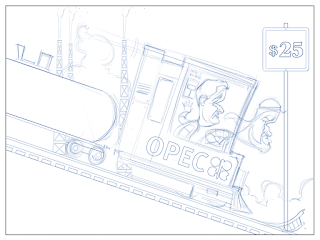 -An OPEC-colored train (complete with OPEC logo) pulling oil tankers going down a hill. -Said train being driven by a determined looking Saudi man (with the flag of Saudi Arabia on his arm) and a nervous-looking Iranian man (with the flag of Iran on his arm) standing behind him and reaching for the emergency brake. -Damaged train tracks somewhere down the line from the train. -A sign that reads "$25" (a reference to the fact that some predictions have oil sliding to $25/barrel). -A nice background of some kind. -3-4 oil rigs spouting oil in the background somewhere. This was a fun comic to draw and I think it turned out pretty well. I'm not sure the front car of the train looks much like any train engine I've ever seen, but I think it's passable. 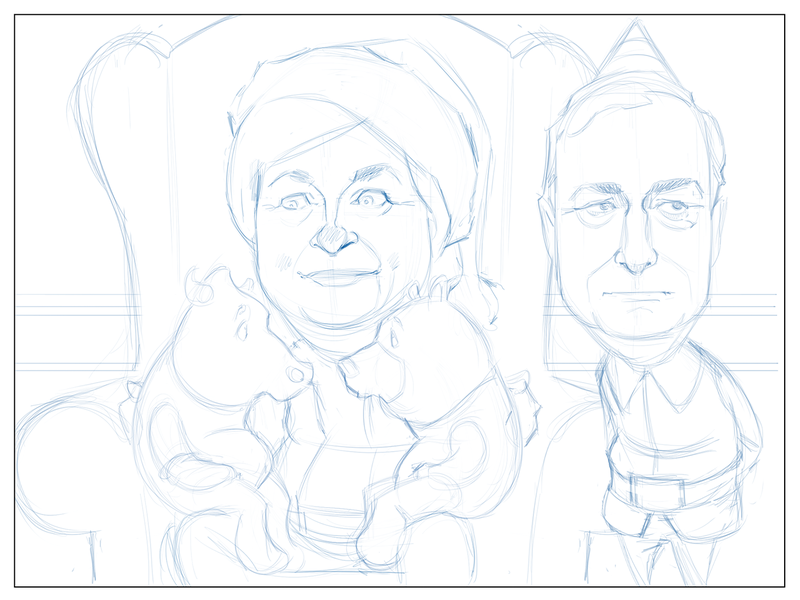 The people were fun to draw. I've been sketching a lot exaggerated profiles of characters lately and some of that more pronounced style found its way into the layout here. I'm also still working on the more loose techniques (line work, shading, brush strokes, etc.) and it continues to be fun. 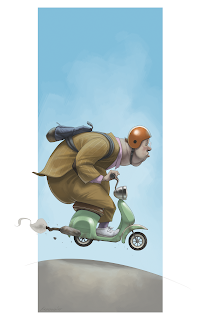 Here's the second illustration in the series of fun, personal illustrations I'm working on right now. Like I mentioned before, I'll probably sell these in print or poster form at some point, I'm just not exactly sure when. But I'll let you know. For now, these are just for fun. And they're plenty of fun. More painterly, more loose, different color choices, and all sorts of goofy weirdness. These make illustration feel like play again, which is great. Here's the latest comic for Investing.com. There was a bit of a hiatus because of Thanksgiving, but I was back in the saddle this week. Unfortunately, during the week-long break, I seem to have forgotten how to ride a horse, so it was a rough and unpleasant ride. 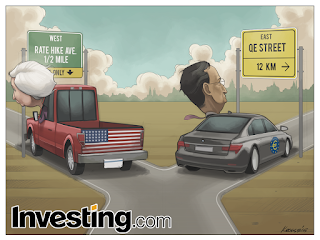 -Janet Yellen and Mario Draghi driving away from each other via a fork in the road. 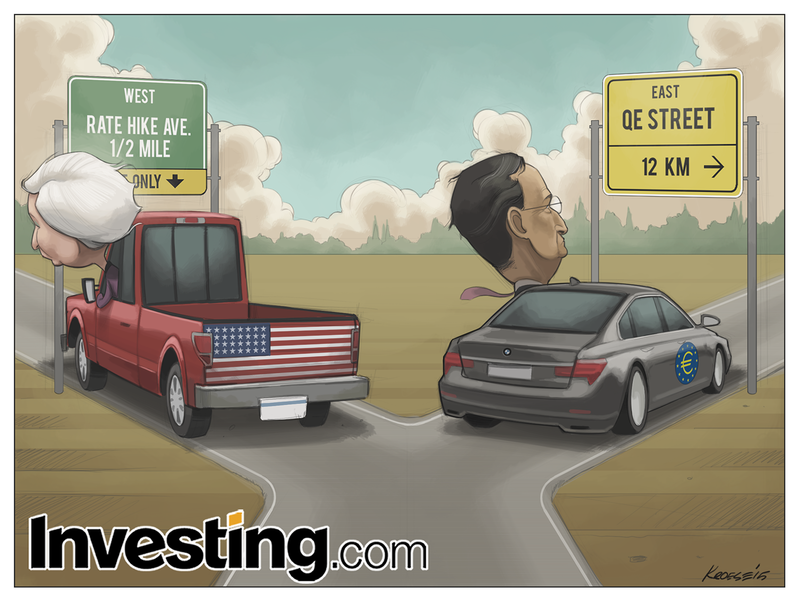 -Janet Yellen in a truck with American flag colors. -Mario Draghi in a BMW with the ECB logo on the side. Overall, pretty straightforward. But the big problem for me is that I was asked to draw cars, which are my Achilles' heal. That's misleading, because it suggests I have only one weakness when it comes to drawing. I actually have many. So I guess it's more like my Achilles' finger or something. But cars are at the top of the list. I find them difficult and tedious to draw. 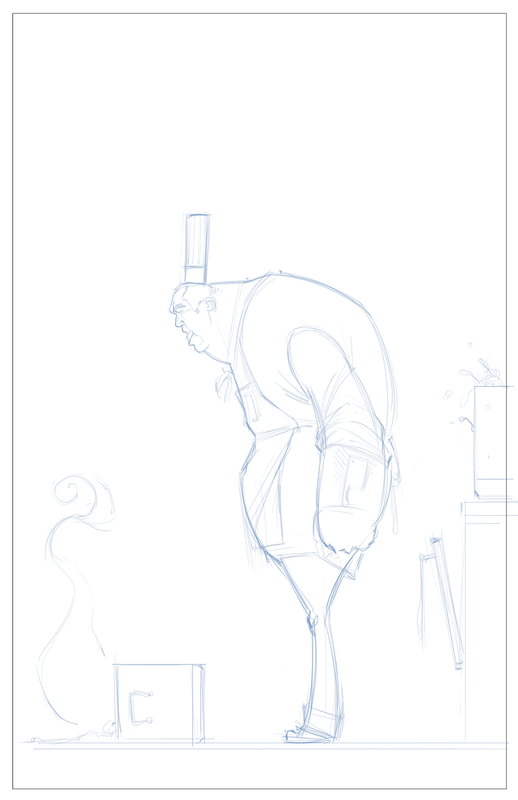 The other tough part was figuring out a composition and layout that would work. 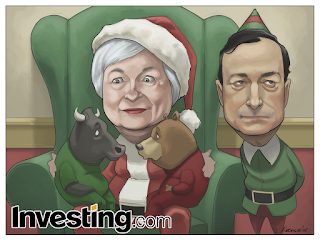 I was asked to draw Yellen and Draghi. No big deal. I've drawn both scores of times before. 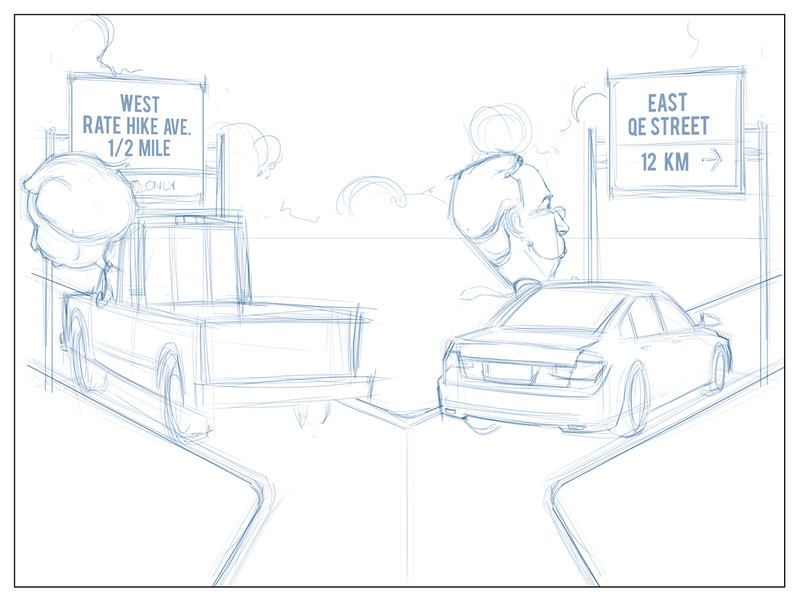 But I was asked to draw them driving away from each other. Ok, still no big deal. I could theoretically draw them driving toward the "camera" (viewer) and still be able to show their faces and their vehicles. But that perspective gets ruled out when the detail of the road signs gets added in. The signs needed to be legible and that rules out the perspective where they're driving toward the camera. It seemed like the best option for the factors involved. 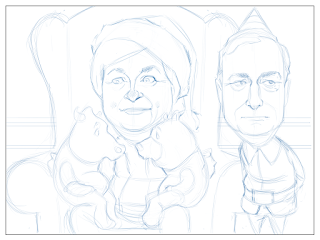 I figured I had to choose between showing Yellen and Draghi's faces at a more recognizable angle OR drawing the road signs in a way that was legible and made sense. Given more time, I might have come up with a different solution that was a better fit, but I didn't have the luxury of time. 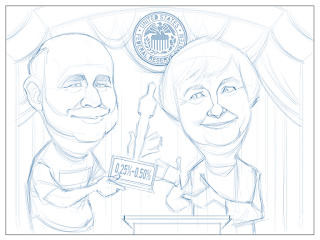 The drawbacks to this layout were chiefly that Yellen and Draghi are seen from the back (and are subsequently less recognizable) and, even more difficult for me, I was drawing two different cars at two different, odd angles. A car under the best of circumstances isn't easy for me. Two cars at 3/4-ish angles is grueling. I do not like how I drew this comic. Not one bit. In my defense, I did the best I could in the amount of time I had. Also, this would have been a tough comic no matter how confident or warmed up I felt. However, I can't say this one is going into the portfolio. It combined a lot of my weaknesses into a single comic and I think the final product shows it. Some comics turn out great and I feel good about them when they're done and, in turn, good about myself. This weren't one of 'em. 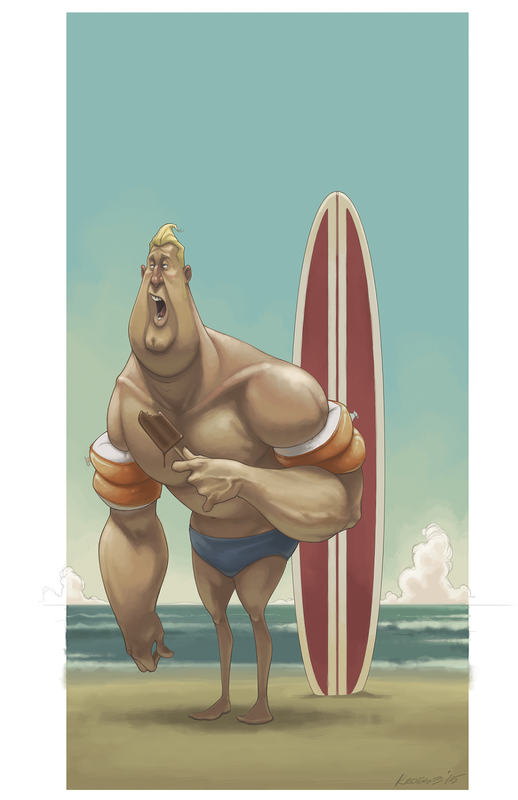 Here's an illustration I did recently, just for fun. 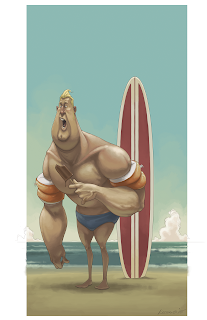 It's part of a series of single-character illustrations where I'm exploring some new techniques. I'll probably be selling prints of this series at some point, and I'll keep you posted when I do.